Nice morph. Too bad it's for the female thing instead of Genesis. Introducing Gia - An ALL NEW Genesis 2 Female Figure from DAZ! Hand-sculpted to show highly-defined arms, legs, abs, and back. Positioned as the ultimate female warrior for your fantasy or urban scenes, Gia is based on the Genesis 2 Female base meaning she is part of the new Genesis 2 Female gene pool. Dial her in at 100% and get the full scale of this muscular yet feminine shape, or blend her with Victoria 6 or future Genesis 2 Female figures to get just the shape you are looking for. 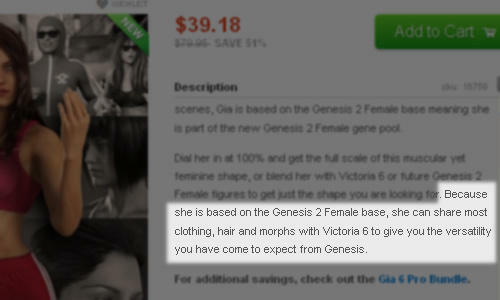 Because she is based on the Genesis 2 Female base, she can share most clothing, hair and morphs with Victoria 6 to give you the versatility you have come to expect from Genesis. Who wants to bet this statement is a response to all of us who feel strongly about the change? Yep. But is that the only thing he could think of that would prove less dire? When I've got four hours to get my next render done, how much time do I need to spend “figuring out” something that happens seamlessly with Genesis1? And how well is this going to work with clothing products that use both posing-bones and movement-morphs? Why should I be buying into this again? Well, that would be a BAD idea considering that statement only makes thing even worse by comparing that female base with a truly versatile figure like Genesis. The versatility I have come to expect from Genesis was removed from the Genesis 2 separate bases. Discussion about the gender split has been cut out of the Gia Discussion thread. Is it going to be cut out of Gia's promo blurb? They don't need to cut it, they can just change the last Genesis reference to Genesis 2 Female. They don't need to change a thing. It is built on Genesis tech so it does exactly what Genesis does. Surprising how now that people see a female shape, the can't envision it doing anything the androgynous one did, where previously people in the beginning couldn't see how that androgynous shape couldn't be a female. Given the context of the sentence itself, it seems like they want us to take comfort in the notion that G2F is just as versatile as G1, just only with a more female specific focus. But yeah, I'm glad they acknowledged this, but the thing is, what I've come to expect from Genesis is an efficient all-purpose go-to base figure that can conveniently be everything and anything I need for a human character; whether it be male, female, child, elder, creature, toon, etc. In fact, THIS image back when the Michael 5 page was around summed up Genesis perfectly! But I can see the argument that Genesis 2 Female is not greater than or equal to Genesis. There would be no debate to the accuracy of the statement if they changed the reference. Yeah I remember that. I think it still applies kinda sorta. Cause one could argue they have two figures in the middle, one is G2F and one is G2M. See! See what? Genesis2Male isn't here for us to see yet, and until it is we've got no way to evaluate the various DAZzlers’ pie-in-the-sky-by-and-by statements.
. . . now that people see a female shape, the can't envision it doing anything the androgynous one did, where previously people in the beginning couldn't see how that androgynous shape couldn't be a female. The problem isn't that nobody believes that it's doable (I remember the V4Male and Vitorio), but that DAZ hasn't done it yet -- when Genesis1 was released the female/male/child options were immediately available as base morphs, and DAZ was committed to filling them out (not that they ever came through with the K5 package). Now I'm supposed to buy chainmail-bikini babe after pin-up girl based on nothing more than vague insinuations that we'll eventually get the versatility that Genesis1 already gives us? (And which we've already spent bocu bucks on over the last couple years, with no solid conversion tools in sight?) We had this before with the Mil4Females on one base and the Mil4Males on the other, with all the double-buying and T&A-catering that went with the gender split -- after what Genesis1 does for us, after we've invested years of time and money into the versatility of the Genesis1 base, why would we want to go back to that? It's a more general issue and so it is better handled in a dedicated thread rather than one dealing with a specific character. That's an old image. But nice example. They are Victoria 5 and Michael 5. Same base. Versatility "I have come to expect from Genesis" and that Genesis 2 Female lacks. I agree that G2F has nothing of Genesis versatility and that this last line in Gia blurb looks like a deliberate "take that" to people who think so. Yep -- essentially, that line is DAZ telling us it's raining. It's not rain. It stinks. I think it is funny that they also put "can share most clothing, hair and morphs with Victoria 6" as if Victoria 6 was a separate figure and not 100% symbiotic morph of the same very base that you can dial in any proportion with or without Gia. Does that mean that Gia isn't comparable even with all G2F things? Promo certainly tells me she isn't, because "most" isn't "all". I may just buy She-Freak V4, $1.99 PC, GenX her and call it a day. A lot cheaper too, and I like some of the facial morphs she comes with. I did a long time ago and it was worth it. Actually I just mentioned that to someone else...You get 8 head shapes, and 4 body shapes. 4! And if you GenX or transfer them over you can dial them in to G1 or G2 with ease. Awesome stuff. Please keep this conversation civil and on topic, without the speculation and unnecessary accusations which are marring the general discussion. It really doesn't seem like anything new is being said. Did you use Kattey's method to get her to G2 (I'm assuming you mean G2F), or did you get the G2 shape into G1? I had already transferred She freak over to Genesis 1, and then when I transferred my Genesis 1 shapes over to G2F the she freak morphs came along with it. I guess I'm missing the good stuff. Everything is civil here. Because she is based on the Genesis 2 Female base, she can share most clothing, hair and morphs with Victoria 6 to give you the versatility you have come to expect from Genesis. Really? Just MOST? Not ALL? I thought the whole thing with abandoning Genesis as a concept was because sticking with separate male and female meshes meant that all those nasty clothes correction problems with a unimesh were going to now be a thing of the past. Wasn't THAT the entire reason for the split? To increase gender clothes compatibility? So we're failing on the entire reason for the new mesh right out the gate? Well... I guess that makes abandoning the Genesis concept totally worth it. I can buy into the "even more gender-specific detailing" polemic right up until I drop her pants... umm, where's the detail? Wait, wait, hang on, here's a plaster cast static model of just the front half of the nether regions... it's a bit like giving a kid a pretend bag of sweets then wondering why they're not happy. Is the all-things-female versatility only intended for clothed renders? O yes, nice sculpting and all that, but the advantages are counterbalanced by the most frustrating of limitations that are as much a commercial decision as the "need" to split genders in the first place. I want my elite figure, my muse, to be capable of what I want it to do, not what somebody else tells me it should do. I've bought V6 and Gia. I like them, but I'm still waiting for the promised bells & whistles that G2F is meant to deliver. OK, even more UV maps? Great, but if we're being so picky about the tiniest of skin texture stretching that means making more UV's, where's the same commitment to realistic hair and clothes? If the quality mismatch doesn't get addressed, all that effort and additional expense will deliver something no more impressive than decade-old technology. No one figure is going to please everyone. Also there is no perfect solution for the figures either. While a single base mesh has its strengths it also has its weaknesses. The same is true for the split male and female based meshes. Concerning Gia, the thought crossed my mind that not everyone is going to want to buy V6 and the muscle and body morphs to get a muscular female character but with Gia they can have that styled character at a lower cost. Though she is not perfect and will not please everyone. Most if not all of us tend to eventually settle for a certain figure for different reasons and and dont always see the need or reason for another figure. Especially one of the same gender.